In dogs in the western world neoplasia constitutes the most frequently diagnosed cause of death. Although there appear to be similarities between canine and human cancers, rather little is known about the cytogenetic and molecular alterations in canine tumours. Different dog breeds are susceptible to different types of cancer, but the genetic basis of the great majority of these predispositions has yet to be discovered. In some retriever breeds there is a high incidence of soft tissue sarcomas and we have previously reported alterations of chromosomes 11 and 30 in two poorly differentiated fibrosarcomas. Here we extend our observations and present a case report on detail rearrangements on chromosome 11 as well as genetic variations in a tumour suppressor gene in normal dogs. BAC hybridisations on metaphases of two fibrosarcomas showed complex rearrangements on chromosome 11, and loss of parts of this chromosome. Microsatellite markers on a paired tumour and blood DNA pointed to loss of heterozygosity on chromosome 11 in the CDKN2B-CDKN2A tumour suppressor gene cluster region. PCR and sequencing revealed the homozygous loss of coding sequences for these genes, except for exon 1β of CDKN2A, which codes for the N-terminus of p14ARF. For CDKN2B exon 1, two alleles were observed in DNA from blood; one of them identical to the sequence in the dog reference genome and containing 4 copies of a 12 bp repeat found only in the canine gene amongst all species so far sequenced; the other allele was shorter due to a missing copy of the repeat. Sequencing of this exon in 141 dogs from 18 different breeds revealed a polymorphic region involving a GGC triplet repeat and a GGGGACGGCGGC repeat. Seven alleles were recorded and sixteen of the eighteen breeds showed heterozygosity. Complex chromosome rearrangements were observed on chromosome 11 in two Labrador retriever fibrosarcomas. The chromosome alterations were reflected in the loss of sequences corresponding to two tumour suppressor genes involved in cell-cycle progression. Sequencing of CDKN2B across many different breeds revealed a widespread polymorphism within the first exon of the gene, immediately before the ankyrin coding sequences. Neoplasia is profoundly important as a cause of morbidity and mortality in the domestic dog, Canis lupus familiaris. In addition to its importance as a working animal and a pet species, the dog is an important intermediate model species for human tumour biology. It has a relatively large body size, often displays responses to cytotoxic or other therapeutic agents comparable to humans, and has a relatively high natural incidence of several cancers with similar biology to human tumours. Dogs have been used as models for cancer therapy, such as in osteosarcoma, in the giant dog breeds, oral melanoma and non-Hodgkins lymphoma, amongst others (reviewed in [1, 2]. In general, the same tumour types are recognised in humans and dogs; for instance, the classification of soft tissue sarcomas of dogs largely follows the human system . Studies of cytogenetic and genetic changes in canine soft tissue sarcomas may reveal more about their aetiology. In a previous study, primary cell cultures were obtained from two poorly differentiated fibrosarcomas . Both tumours (which were name-coded LE and ME) came from adult female Labrador retrievers. Chromosome painting revealed they both had abnormalities in chromosomes 11 (CFA11) and 30 (CFA30). One tumour (LE) contained four translocation chromosomes involving CFA4, CFA11, CFA27 and CFA30 (tumour karyotype 2n = 78; t(4;11;30), t(11;27); t(27;11); t(30;4); der 11 (del 11q)); the second one (ME) had a deletion of CFA11q and trisomy of CFA30 (tumour karyotype 2n = 79; der11; +30). An attempt to isolate the translocation chromosomes by Fluorescence Activated Chromosome Sorting had not allowed complete purification of these chromosomes but PCR of sequence tagged sites (STS), on sorted preparations, had shown that sequences in the first 7 Mb of CFA 27 and the last 20 Mb of CFA11 were present in the LE tumour genome, but missing when t(27;11) was excluded. Rearrangement in the Transforming Growth Factor Beta Receptor 1 gene (TGFBR1) was implied as only a portion of the exonic sequences could be obtained by PCR of DNA in this preparation. In addition to this altered copy of TGFBR1, the tumour still had at least one normal coding sequence of the gene. This tumour sequence was identical to that obtained from blood DNA of the same individual. At least one normal coding sequence of TGFBR1 was also present in the tumour ME. Here we extend our search for molecular alterations of CFA11 that could be linked to canine sarcomas and present a case report involving the loss of heterozygosity in a region harbouring two tumour suppressor genes. To obtain a more detailed description of rearrangements in chromosome 11 in these fibrosarcomas, eleven canine BACs spaced at intervals along chromosome 11 were used to probe tumour metaphases, in some cases in combination with chromosome paints identifying translocation partners (Table 1). For LE, the distribution of BAC hybridisation suggests that the der11 and t(4;11;30) chromosomes originate from one chromosome 11 whilst t(11;27) and t(27;11) originate from the other (Figure 1). However, the pattern of rearrangements in derivative chromosomes is complex. The der11 chromosome contains both centromeric and telomeric sequences in an inverted arrangement, whilst central parts of this chromosome 11 are found in t(4;11;30) (BACs between 375-F21 and 381-N7 locate here). t(11;27) contains the centromere proximal region of CFA11. Although no BACs more telomeric than 375-F21 hybridised to this chromosome, chromosome painting suggests that more than half of the normal CFA11 is present, so there may be some further interstitial insertion of sequences not represented by the BACs used here. More telomeric BACs hybridised to t(27;11) but, again, these showed rearrangement such that 381-H22 has a sub-telomeric position whilst BACs which lie distal to this in the normal chromosome are now placed near the centre of the derivative. The translocation break/fusion point is close to RP81_381-N7 with BACs derived from centromere proximal sequence found distal to this position in the fusion chromosome. BACs used for in situ hybridisation. *NA = Data not available. Chromosome painting of metaphases spreads from canine fibrosarcoma LE. Chromosome painting of tumour LE (6 colour paints, colours as shown) shows 4 derivative chromosomes containing CFA11 DNA. To look at the distribution of CFA11 BACs, metaphases were hybridised with a mixed paint of CFA 4, 27 and 30 (green) and a single BAC paint as indicated in examples shown, (red). For N7, where the t(27;11) is difficult to identify because of a high green background, additional hybridising chromosomes from other metaphases are shown; inset at twice the scale. Diagrams summarise hybridisation of all BACs with each derivative containing chromosome 11. The red arrowheads denote BACs consistently binding to the chromosomes shown. 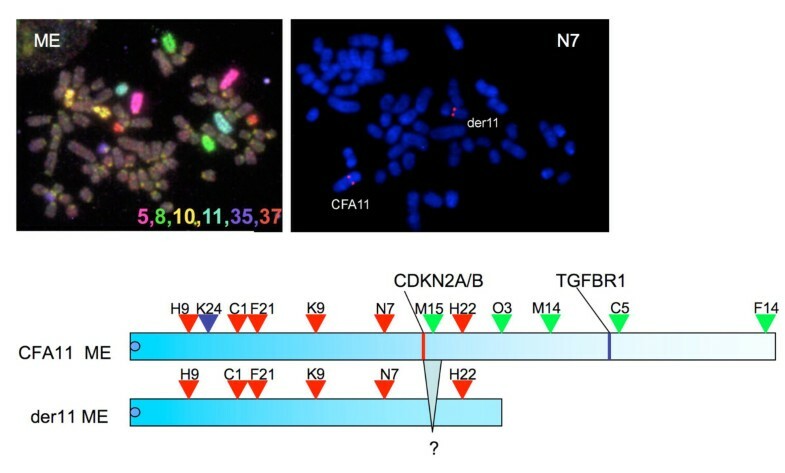 Chromosomes in the diagram are CFA11 in blue (mid blue -centromeric; light blue -telomeric); CFA27 green; CFA4 yellow; CFA30 purple. For ME, BACs telomeric of RP81_381-H22 did not hybridise to the derivative chromosome, but RP81_381-H22 itself did (Figure 2). There was also lack of signal from RP81_376-M15 on the derivative, suggesting interstitial deletion of the derivative chromosome in the area of this BAC. In independent RH mapping studies the BAC 381-F14 is placed on chromosome 11 at position 8810, telomeric to 373M14 . Chromosome painting of metaphases spreads derived from fibrosarcoma ME. Chromosome painting of tumour ME (6 colour paints, colours as shown) shows a der11 with ± 40% of the genomic material of the normal chromosome. An example BAC hybridisation is shown, using RP81_381-N7 (red). Diagrams of the normal and derivative chromosome show hybridisation positions of BACs: red arrowheads – BACs consistently binding to both chromosomes; green arrowheads -those not hybridising to the derivative; blue arrowhead -consistent hybridisation to the normal but inconsistent to the der 11 chromosome. For LE, genomic DNA from blood and tumour was available, while only tumour DNA could be obtained for sample ME. Loss of heterozygosity on CFA11 was analysed for the LE fibrosarcoma. Forty-five microsatellites distributed across the chromosome were studied (Table 2). Complete loss of heterozygosity (loss of the 262 bp allele) was observed for marker CAMC11.029, and a substantial loss (of the 224 bp allele) for marker CAMC11.026 (22% remaining signal) (see Figure 3). The region between these two markers contains sequences orthologous to the human genes coding for the proteins p15INK4B, p16INK4A and p14ARF. The first one is coded by the cyclin-dependent kinase inhibitor 2B gene (CDKN2B), while the other two are coded by cyclin-dependent kinase inhibitor 2A (CDKN2A) [reviewed in ]. A marker (CAMC11.027) within the canine CDKN2B-CDKN2A region was uninformative (homozygous in blood and tumour DNA for sample LE). Most other markers showed no change between tumour and blood, but one further marker, (FH4031, 29.9 Mb proximal from CAMC11.026), showed partial loss of one allele (37% remaining signal). For marker CAMC11.004 (10 Mb from CAMC11.026) a discrepancy was observed in the results corresponding to the blood and the tumour; the former presented a heterozygous genotype, while the tumour had a single allele that was different to either of those observed in the blood. *Microsatellites are listed according to their position in Ensembl's CanFam 2.0 (July 2008). The position of exons within the CDKN2B-CDKN2A gene cluster is provided, along with the position of the gap between contigs 16328 and 16329, and the location of TGFBR1. §The numbers in the genotype columns correspond to the PCR product sizes (in base pairs) of the alleles, as determined by the sequencing instrument. Map of the canine region containing the CDKN2B-CDKN2A locus. Top, position of CAMC11.026, CAMC11.029, and of the gap in the genomic sequence assembly. Middle, microsatellites presenting loss of heterozygosity; also, position of predicted CDKN2 related exons (darker grey), other unrelated exons (light grey), and canine ESTs in the database (black). Bottom, exon designations used here. CDKN2A and CDKN2B have not been fully described in the dog. No mRNAs or ESTs that completely define these genes are available, and gene prediction programmes do not fully agree with each other or with those EST that are available. In addition, the area is extremely GC rich and has proved difficult to clone or to sequence, containing a gap in the CamFam 2.0 genome assembly [7, 8]. Alignments with human and other CDKN2A/B RNAs appear to be the best guide to gene structure. We used these to design PCR primers. To determine whether the expected remaining copy of these genes had any mutations in tumour LE, the predicted exonic sequences, and their flanking intronic sequences, were investigated. Since the gap in the dog reference sequence is where CDKN2A exon 1α is expected to be present (Table 2 and Figure 3), it was not studied. However, a PCR product could be obtained for the predicted exon 1β; this sequence was identical to that observed in blood DNA from the same individual, and to the sequence in the reference genome. In contrast to this, for CDKN2A no PCR products of exon 2 could be obtained from tumour LE's DNA in spite of repeated attempts, but the sequence was obtained from blood DNA and it contained no difference when compared to the reference genome. When using DNA from tumour as template, no PCR products could be obtained for CDKN2B exons 1 and 2 and their flanking intronic sequences. In LE's DNA from blood, the sequence of CDKN2B exon 2 was the same as in the reference genome. Exon 1 of this same gene could not be PCR-amplified from tumour LE but it was amplified using DNA from blood, and then cloned and sequenced. The results showed that this individual was heterozygous, having one allele with the same sequence as the reference genome (g. [109GGC; 124GGGGACGCCGCC]) as well as a shorter allele (g. [109GGC; 124GGGGACGCCGCC]). At the amino acid level the first allele would have five Gly residues followed by four tandem copies of the sequence GlyAspGlyGly (p. [Gly10; Gly15_Gly18]), while the second allele would consist of five Gly followed by only 3 copies of the tetrapeptide (p. [Gly10; Gly15_Gly18]) (Figure 4). Predicted canine CDKN2B exon 1 amino acid sequences. Alternate Gly residues in the polymorphic region have a grey background, while the GlyAspGlyGly repeats are enclosed in a frame and alternate repeats also have a grey background. In LE's tumour DNA the exon was missing, but not in peripheral blood where it was heterozygous. Alleles are identified in a simplified way (e.g., ] corresponds to p. [Gly10;Gly15_Gly18]). CDKN2B exon 1 genotype determination in dogs of different breeds. Dye-labelled PCR products were separated by capillary electrophoresis. Fragments representing all different sizes were sequenced to confirm the identity of the alleles. CDKN2B exon 1 alleles observed in canine blood and tumour samples. Alternate GGC triplets coding for Gly have a grey background. The dodecameric nucleotide sequence (GGGGACGGCGGC) coding for the GlyAspGlyGly repeats are within a box, with alternate repeats having a grey background. Intronic sequences are in lowercase. Alleles are identified with a short version of their description; e.g., ] stands for g. [109GGC;124GGGGACGGCGGC]. The ] allele corresponds to the reference genome (CanFam2.0). To search for additional polymorphisms in these two genes, exon 2 of CDKN2B was studied using DNA from blood samples from a Bernese mountain dog, four boxers, nine flat-coated retrievers (four with histiocytic sarcoma and five free from neoplasia), two golden retrievers and a Labrador retriever. No polymorphisms were seen in the coding region or the flanking intronic bases. Exon 2 of CDKN2A was also sequenced from DNA obtained from blood samples from three Bernese mountain dogs, four flat-coated retrievers with histiocytic sarcoma, and five flat-coated retrievers free from tumours, two golden retrievers and four Labrador retrievers. A coding SNP was identified that led to a non-synonymous change in the predicted codon 19 of exon 2 that is shared by both p16INK4A and p14ARF. The polymorphism was a g.1206A>G transversion that corresponds to a p.Gln79Arg change in the predicted amino acid sequence of p14ARF (Figure 7) and an Asn to Asp change in the p16INK4A reading frame (Figure 8). Both alleles were found in all breeds studied, except in the boxer where all four individuals were homozygous for the reference sequence. In the flat-coated retrievers half of the histiocytic sarcoma cases were GG homozygous and the rest AG heterozygous, while two controls were homozygous GG and three were heterozygous. 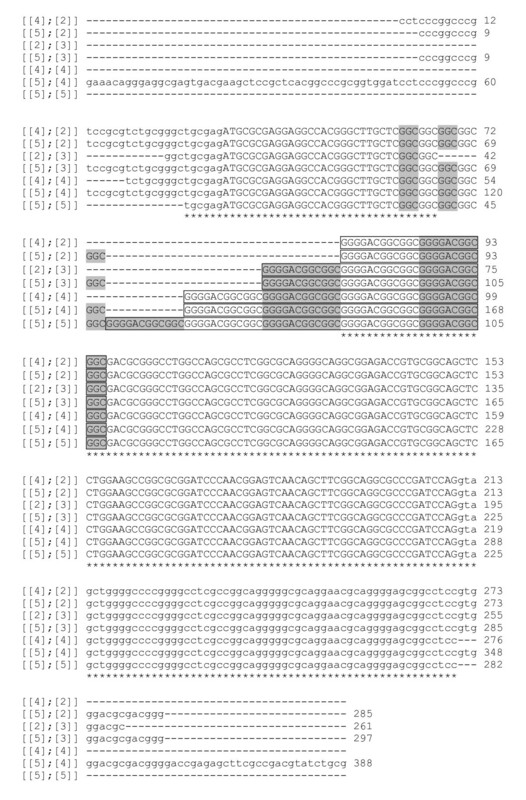 Polymorphism in exon 2 of canine CDKN2A in the p14 ARF reading frame and alignment to orthologous sequences. 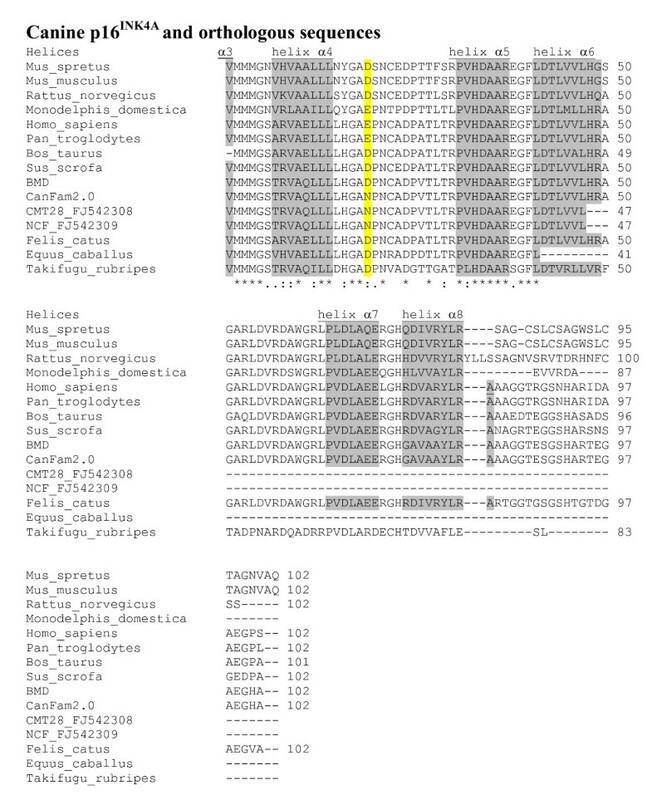 The dog polymorphic residue is highlighted in yellow. 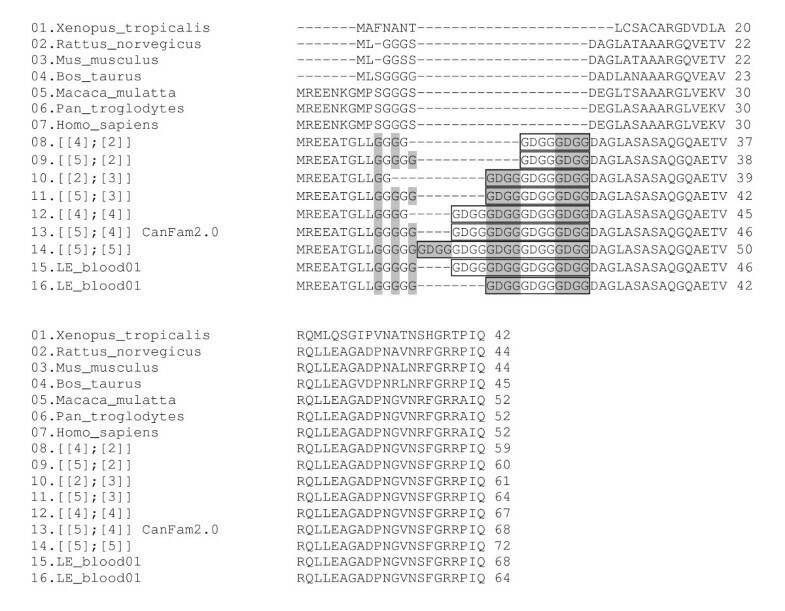 Polymorphism in exon 2 of canine CDKN2A in the p16 INK4A reading frame and alignment to orthologous sequences. 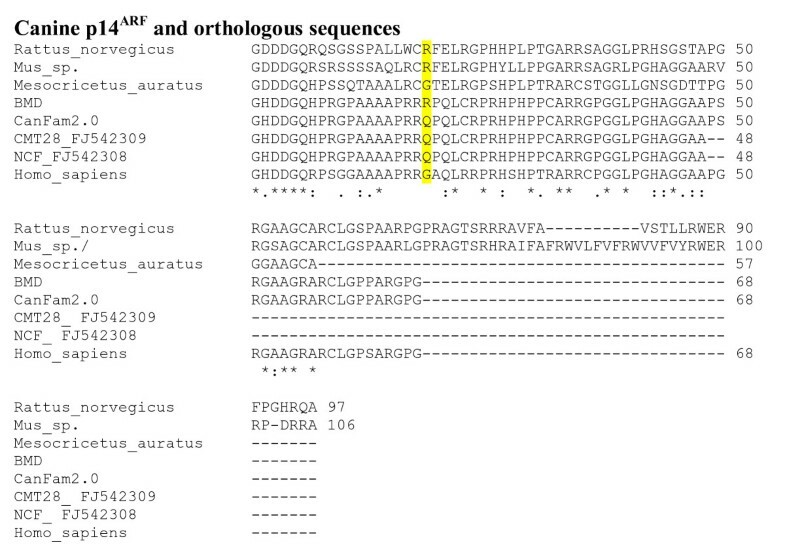 The canine polymorphic position is highlighted in yellow in the loop joining the second and third ankyrin repeats. The α helix residues of the ankyrin repeats have a grey background. CanFam2.0 -dog reference genome; BMD -Bernese Mountain dog with the alternative Asp residue; CMT28_FJ542308 -canine mammary tumour cell line; NCF_FJ542309 -cultured canine fibroblasts. A previous analysis of two canine fibrosarcomas with rearrangement of chromosome 11 was followed up by BAC mapping. In both tumours this revealed that rearrangements were more complex than had been seen using chromosome painting. In LE all chromosomes containing fragments of chromosome 11, except t(11;27), showed interstitial deletions and or rearrangements. In ME a deletion around BAC M15 was observed. 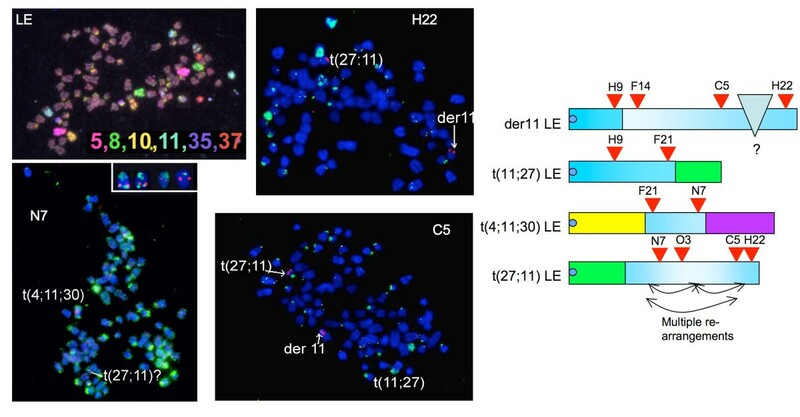 Loss of heterozygosity (LOH) on chromosome 11 was studied in LE's tumour. Marker CAMC011.004 (34.56 Mb) presented an allele in the tumour which was different from any of those in the blood. This result was confirmed in two independent experiments. This marker is within a gene desert, with no proven transcripts encoded or genes modelled within about a megabase. Our data does not show whether this marker is close to a rearrangement. FH4031 (14.24 Mb), which shows LOH, is also some way from the nearest known gene. In this case more proximal markers are not informative. It seems likely that, in the tumour, the der11 and t(4;11;30) chromosomes have lost some sequences in this region, which is near the proximal chromosome breakpoint in both. Loss of heterozygosity was also observed in two markers which bracket a region encompassing the CDKN2B-CDKN2A gene cluster. Even though the microsatellite study pointed to loss of heterozygosity rather than complete loss of the region containing CDKN2A and CDKN2B, no PCR products could be obtained from the tumour for the genes themselves, except for CDKN2A exon 1β. The sequence of this exon showed no differences with the reference one. A microsatellite within the gene cluster could be amplified but it was homozygous in blood and thus non-informative regarding loss of heterozygosity. This microsatellite is 8 kb away from CDKN2A exon 1β and 3 kb from CDKN2B exon 2, which could not be detected in the tumour DNA. These results suggest that two copies of parts of chromosome 11 are present in the tumour, while other regions are present only once, and still others, close to the latter, are completely missing. This complex pattern is reminiscent of the alterations observed for t(27;11), where TFGBR1 exons 3 to 6 and 9 were observed, but not the rest of the exons . This agrees also with the recent observation on the complexity of chromosome rearrangements in human tumours . Both approaches, BAC mapping and loss of heterozygosity, point to alterations on canine chromosome 11, in the region equivalent to human chromosome 9p21 which is commonly deleted in human tumours  and contains the genes CDKN2B and CDKN2A. The first codes for the protein p15INK4B, while the second codes for p16INK4A and p14ARF which are proteins derived from alternate exon 1 sequences and use different reading frames for the common exon 2 [11, 12]. p16INK4A and p14ARF regulate the retinoblastoma protein 1 (pp105RB1) and the tumour protein 53 (TP53), respectively. These form part of the two pathways most commonly disrupted in human tumours. Recently a new protein, smARF, also coded by CDKN2A, was identified in mouse and human and localised in the mitochondria . It has been shown to inhibit cell growth and proliferation, and to induce apoptosis in a TP53-independent manner [14, 15]. CDKN2A also codes for the proteins p12 and p16γ which are less well understood [16, 17]. In mice, disruption of either p19Arf (the orthologue of human p14ARF) or p16Ink4b, or both, results in increased predisposition to tumour development [18–21]. In humans, homozygous deletions are the most frequent type of mutation involving these genes , as opposed to the combination of mono-allelic deletion followed by the mutation of the remaining copy of the gene, which is the common pattern in other tumour suppressor genes . However, alterations affecting only one of p15INK4B, p16INK4A or p14ARF have been reported . Apart from homozygous deletions, 5'CpG methylation has also been observed in some tumours [12, 24–26]. In human patients with soft tissue sarcomas, loss of CDKN2B and CDKN2A is associated with reduced survival , while in dogs, absence or reduced levels of p16INK4A have been reported in melanoma tumours and cell lines , as well as in osteosarcoma cell lines . In canine non-Hodgkin's lymphoma (NHL), deletion of p16INK4A or loss of CFA11 have been observed in high-grade T-cell NHL, without comparable alterations seen in high-grade B-cell NHL or in low grade tumours . In this same paper, p16INK4A methylation was observed in a single low-grade T-cell lymphoma. In addition to this, in two canine mammary tumour cell lines, CMT12 and CMT27, no expression of p16INK4A was observed, while in a third cell line (CMT28) increased expression was detected . Upon transfection of a complete human p16INK4A cDNA, these cell lines lost most of the characteristics of the transformed phenotype . The sequences of CMT28 and of canine fibroblast cultured cells were reported to differ from the reference sequence, although the nucleotide and the aminoacid sequences are identical to the canine reference sequences used here for the second exon of p16INK4A and p14ARF (Figure 7 and Figure 8). CDKN2A exon 1β codes for the N-terminus portion of p14ARF. The first amino-acid residues of this protein are relatively well conserved and have an important role in binding MDM2 while the rest of the protein, containing a nucleolar localization signal, is poorly conserved and may be dispensable [11, 32, 33]. In chicken, exon 1α of CDKN2A has been lost and no p16INK4A protein is produced . Exon 1β is spliced to the still existent exon 2 but the predicted protein terminates at the end of exon 1β, with no residues from exon 2. In spite of this, the protein is able to bind MDM2 thus preventing the induction of TP53 degradation and the inhibition of TP53 expression . It is therefore likely that exon 1β codes for the amino acid residues required for p14ARF to perform its normal role. Moreover, aberrant p16INK4A transcripts have been observed in tumours  and some of them are translated and are able to function in cell-cycle control . In the present study only exon 1β of CDKN2A was observed in LE's fibrosarcoma. It is possible that an abnormal version of p14ARF could have been produced; it is unknown whether the remaining exon 1β would have been spliced to another sequence, generating an abnormal transcript and, possibly, a shorter version of p14ARF, as is in the chicken. In the current study, a polymorphism was observed in exon 2 causing missense mutations in both p16INK4A and p14ARF. The polymorphic residue is in the loop joining the second and thitd ankyrin repeats of p16INK4A. This residue is on the surface of the protein . Although it does not interact with CDK6, it does seem to have a role in stabilising the structure of p16INK4A [38, 39]. In other species this position is occupied by the acidic residues Asp or Glu, so the polar neutral Asn residue seems to be unique to dogs. However, other structurally related proteins with ankyrin repeats have Asn in the equivalent position (e.g., p18) . Polymorphisms in short repeat sequences within coding exons have been observed before [40, 41], whilst somatic repeat instabilities are well documented in other species both in tumours and in some degenerative diseases. The putative first exon of CDKN2B in dogs has a predicted GlyAspGlyGly repeat that is not found in other species. This exon is represented in the database by two ESTs [GenBank: CX985268 and GenBank: DN749168]. The multiplicity of alleles in this gene may have resulted from occasional misalignments during crossover events between homologous chromosomes, leading to the expansion and contraction in the number of GGC triplet and GGGGACGGCGGC dodecamer repeats. No instances were observed of nonsense mutations in this region, nor were indels found that would produce shifts in the reading frame. In the case of flat-coated retrievers, which show a high predisposition to developing histiocytic sarcomas, cases and controls were found to have a similar distribution of exon 1 alleles. Moreover, the sequences obtained from genetic material from blood samples of various breeds suggest that the variation in the number of Gly residues and in the number of GlyAspGlyGly repeats is a normal polymorphism in this species. p15INK4B, coded by CDKN2B, and the rest of the members of the inhibitor of kinase 4 (INK4) protein family (p16INK4A, p18INK4C and p19INK4D) have ankyrin repeats that play an important role in the folding of the protein and in intermolecular interactions with other proteins, such as the cyclin-dependent kinases . p15INK4B and p16INK4A are similar proteins that appear to be the result of a gene duplication event ; both have 4 ankyrin repeats and they appear to function in a similar manner and may be interchangeable . However, p16INK4A has been studied in more detail. It is known, for example, that this protein's loops 1 and 2, as well as some of the ankyrin repeats themselves, interact with CDK6 [38, 44–46]. The GlyAspGlyGly repeats predicted to exist in canine p15INK4B are immediately before helix α1 of the first ankyrin repeat. Hence the polymorphism may not disrupt the folding or function of the protein which is dependent on the ankyrin repeats and the loops connecting them. These GlyAspGlyGly repeats would introduce a region of small glycine residues punctuated by charged aspartates causing a difference in molecular size at the N-terminus of the protein. p15INK4B is induced by transforming growth factor, beta 1 (TGFB1) [47–49]; this induction may be direct, through the binding of TGFB1 to a sequence within the promoter of CDKN2B . In a previous study we showed that the breakpoint of the translocation chromosome t(27;11) involves TGFBR1  which codes for a receptor to TFGB1. However, the tumour still contained a complete coding sequence of the gene. It seems, therefore, that the pathway is disrupted at the level of p15INK4B and p16INK4A through the homozygous deletion of their coding sequences, while the possibility still remains that an abnormal p14ARF could be present. In fibrosarcomas studied in this work complex rearrangements of canine chromosome 11 were observed, causing changes in genes in the TGFB – p14INK4B pathway. Study of CDKN2B showed unusual variants present in exon 1 of the gene in different breeds of dog, as a result of a simple repeat sequence. No instances of missense or frameshifting mutations were observed. However, it is possible that the genomic plasticity of CDKN2B observed here is connected with the rather high frequency of cancers in the domestic dog. The two tumours, corresponding to two dogs name-coded LE and ME, have been described previously . Both are fibrosarcomas from adult Labrador retriever females from the pet population. Blood samples were obtained from excess material used for the purpose of clinical diagnostic studies of dogs admitted to the Queens Veterinary School Hospital of the University of Cambridge. 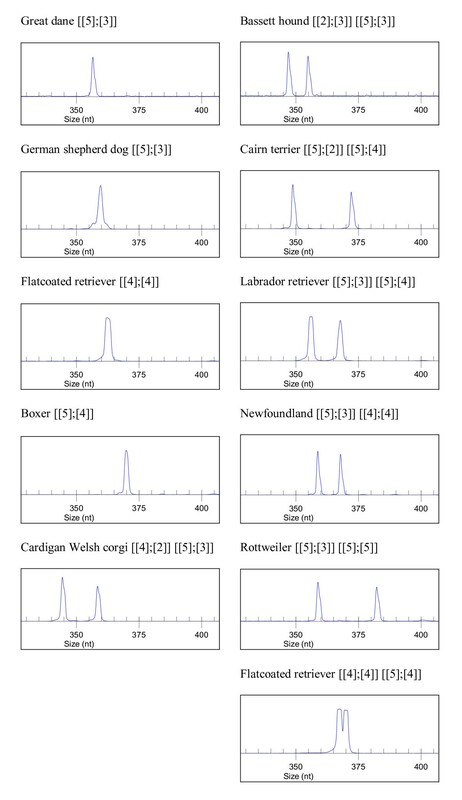 Chromosome paints for seven colour FISH and other combinations of single colour canine chromosome paints were prepared and used as described previously . BACs were from the RPCI-81 canine BAC library , and DNA's from them were labeled with biotin-dUTP or digoxigenin-dUTP by nick translation. For hybridization, 300 ng of labeled DNA in 1 μl TE representing one chromosome paint probe mix, or 50 ng of labeled BAC DNA, was mixed with 14 μl hybridization buffer (55% formamide,11% dextran sulphate, 2.2 × SSC, 45 mM sodium phosphate pH7,1.1× Denhardt's solution (Sigma), 0.5 mM EDTA, 45 μg/ml canine Cot-1 DNA), heated at 70C for 10 minutes, then left 20–30 minutes at 37°C to allow pre-annealing of the Cot-1 DNA. Metaphase preparations on glass slides were denatured, dried and hybridized to the denatured probes. Hybridization was overnight at 37°C in a humid chamber. Slides were washed two × 5 mins in 50% formamide/50% 2 × SSC at 45C followed by two × 5 mins in 2 × SSC at 45°C and a final wash in 4 × SSC, 0.01% Tween20 before application of fluorochrome-conjugated antibodies. Biotin labeled probes were visualized using Cy3-avidin (single colour FISH) or Cy5-avidin (multi-colour FISH) (1:500 dilution, Amersham). FITC labeled probes were visualized using sequential application and washing of rabbit anti-FITC (1:200) and FITC-labeled goat anti-rabbit antibodies (1:100). After 20 minutes incubation at 37°C, excess antibody was washed off by three 5 minute washes in 4 × T at 42°C. Slides were mounted with Vectashield containing DAPI and images were captured as before . Fluorescence signals were captured separately as 8-bit black and white images through appropriate excitation filters, normalized, and merged into a 24-bit colour image. 10 – 15 metaphases were captured for each probe mix. For one of the patients (LE) blood was available and DNA was extracted using the QIAamp DNA Blood Mini kit (QIAGEN) according to the manufacturer's instructions. This same extraction procedure was used for the bloods used to study the CDKN2B exon 1 polymorphism in 18 breeds. For individual LE, for which tumour and blood DNA was available, loss of heterozygosity analysis was performed. Microsatellite markers were chosen along the canine chromosome 11; the location of non CAMC markers and their primer sequences appear in the dog reference genome in Ensembl . To fill the gaps between adjacent markers, and to increase the density in some regions of interest, such as those around the CDKN2B-CDKN2A locus and the TFGBR1 gene, additional microsatellites were identified from the dog reference sequence: appropriate contig sequences were analysed with Tandem Repeat Finder version 4.00  and primers were designed manually or using Primer3 [55, 56]. These markers carry the prefix CAMC in the name. All PCR reactions had a final volume of 10 μl, with 1 to 10 ng of genomic DNA as template, 5 U of Taq polymerase (Invitrogen), a final concentration of 0.2 pmol/μl for each primer, 1.5 mM of MgCl2 and 0.25 mM of each dNTP. For markers with the CAMC prefix, the PCR products were labelled indirectly using a two-step amplification procedure. For these markers, the forward marker-specific primer had a T7 universal sequence (5'-TAATACGACTCACTATAGGG-3') added to its 5' end. These markers, with forward and reverse primer sequences (omitting the T7 sequence from the forward primer), are: CAMC11.001 (AAATGGTCCATCAGAG, ACTAGCTAAGAACTTCATGG); CAMC11.002 (AGTGCTTTGATGCTGA, GAAAGACCTACATTAGTACC); CAMC11.003 (ATAAGACCAAACCTAC, TCTCATGTTTCTGAAGAGTG); CAMC11.004 (AAGTAGCCATACTAAT, CTCAGACCTTATCTATTTGG); CAMC11.005 (ATGGGTATTAAAGACG, CCAAACTGAACCAACATGAG); CAMC11.006 (AACACTCAGTCAAGCC, ATCGGACTCCTTCCATGCTG); CAMC11.007 (CTTGGATAAGCTCTGC, TTCTGGACAGTACTACATTC); CAMC11.008 (GGAGGGGGATTGGTTTTGAT, ATGCTCACTCACTCGCATGT); CAMC11.009 (CCTGTTGGAACTGGAGCTTT, TTTGGGATAATCTAAAGCAAATC); CAMC11.010 (GGGTACCTTCTTTCGGCATT, CATAGCTGACTCCCTTGAAG); CAMC11.011 (CCCTCATACCACGGCTTTTA, ATGACCAAAACTGCCCAGAG); CAMC11.012 (TTCTTCTTTGGGAGTTGCACA, TTCAGCTCCCTTGGAAACTC); CAMC11.013 (ATGGTAGATGGAGGACCTGA, CAGGATGTGTGAAGGGGAG); CAMC11.014 (GGCAGAGGGTGGGTAAAATA, GCCGCCCTGTATGCCTTTT); CAMC11.015 (ACATGTGAAGGCAACCATTTG, TTGCTTAGACAGTATGAAATATG); CAMC11.016 (TTATCCCTGGAAACCCAACAT, TGGCCAAGGTTACACAGTAG); CAMC11.017 (GATGGGACAAGTGTCAAAGG, TTGTCCTCTGAGCAAGTCTG); CAMC11.018 (CAGGAGCCCACTCCTTTTTA, GAGTGACTGTGCGTGTGTG); CAMC11.019 (GCACATGAGGACCCTTCAAT, ATGTCATGGAAAACTGCAAGC); CAMC11.020 (AGTAAACACTACCACATCTGG, TCAGGTGGAGCCAGGTTTTA); CAMC11.021 (ATCATGGAACCCAGAGCAAC, AAGCCAGCTCATCAAGGAGA); CAMC11.022 (TCCTGAGAAAGGCCTGGATA, GCCCGTCAAGTTAGTGAGG); CAMC11.023 (CTGCCAACTCCTCCTCTGT, CCCTCCCAACTGTTCCAAAT); CAMC11.024 (AACAGCAGGACAAAGTCTGC, ATATCATTCGTGGCCCTTCC); CAMC11.026 (TCATGGGTCATGAGATGGAC, GCCCTCATGAATGGGATTAG); CAMC11.027 (CACAGAATAACTCAATAGGTTG, ACTTCTGTGAAGTGCCTTATG); CAMC11.029 (GGTTCAAGTTCAGAATGCTTG, GTTTAGCGTTAGCGCCTGC). For the first PCR these unlabelled primers were used; 1 μl of these products were then used as template for a second PCR reaction with a T7 primer having a D2, D3 or D4 label (Proligo) on its end. The first PCR reaction was a touch-down PCR with an initial annealing temperature of 66°C; this temperature was decreased by 1°C for 12 cycles, followed by 30 cycles with an annealing temperature of 54°C. For the second PCR 25 cycles were performed with an annealing temperature of 54°C. For all PCRs, each step had a duration of 20 sec. For markers whose name does not have the prefix CAMC, the PCR amplifications were performed with a single reaction using forward primers labelled with D2, D3 or D4 (Proligo). After PCR amplification, regardless of whether one or two step reactions had been performed, all PCR products were diluted 1:8 to 1:12 using sterile water. Two microlitres of each diluted product were mixed with 0.15 μl of D1-labelled GenomeLab DNA size standard 600 (Beckman Coulter) and 30 μl of GenomeLab Sample Loading Solution containing formamide (Beckman Coulter). The products were then run in a CEQ8000 sequencer (Beckman Coulter) and genotypes were retrieved with the instrument's Fragment Analysis software. This same program was used to determine loss of heterozygosity, by comparing the peaks obtained from the blood sample and for the matching tumour. Loss of heterozygosity was noted when either peak showed a greater than 30% loss of signal. Primers were designed for studying CDKN2B and CDKN2A exonic sequences plus the flanking intronic bases. The primer names, sequences (5' to 3'), starting and ending annealing temperatures for touchdown PCR, and PCR product sizes were as follows. For CDKN2B exon 1 primers 1729 (GAAACAGGGAGGCGAGTGAC) and 1730 (CGCAGATACGTCGGCGAAGC), 70°C to 58°C, 388 bp; for CDKN2B exon 2 primers 1731 (GAAATGGTCCACCTGTCCCTG) and 1732 (CACCGTGACTCAAGTCTCCTG), 72°C to 60°C, 470 bp; for CDKN2A exon 1b primers 2257 (GAGCTTCCACCCCTAGAAAC) and 2258 (CGGCTCCGAGATCGGAGG), 72°C to 60°C, 526 bp; and for CDKN2A exon 2 primers 1727 (CTTGTAGCGGCATCTGCATGG) and 1728 (TGCTCTGGGCTGCGGAAG), 72°C to 62°C, 459 bp. CDKN2B and CDKN2A sequences are GC-rich, so they were PCR-amplified with AccuPrime GC-Rich DNA polymerase (Invitrogen) using Buffer A for that enzyme. PCRs were done in 40 μl, using 6 to 30 ng of genomic DNA, a final concentration of 02.pmol/μl for each primer and 1.6 U of the polymerase. All amplifications were done using touchdown-PCR. PCR products, except for CDKN2B exon 1, were cleaned with the QIAquick PCR purification kit (QIAGEN), sequenced with the GenomeLab DTCS kit (Beckman Coulter) and ran in a CEQ8000 sequencer. Sequences were analysed and aligned against the canine genomic reference sequences using the Sequence Analysis and Sequence Investigator modules on the sequencer. Differences with respect to the reference sequence were confirmed by sequencing the complementary strand. CDKN2B exon 1 PCR fragments from tumour samples were cloned and then sequenced. AccuPrime's GC-rich polymerase proofreading activity yields blunt-ended products; to clone the fragments into the PCR4-TOPO vector of the TOPO TA Cloning Kit for Sequencing (Invitrogen) a 3' A-overhang was incorporated to the PCR products by incubating them with 1 μl of Taq polymerase (Invitrogen) at 72°C for 10 min. Sequencing reactions with the GenomeLab DTCS kit were performed according to the manufacturer's protocol for plasmid templates except that betaine (Sigma) was added to a final concentration of 1 M. The reference sequences used were CanFam 2.0, assembly May 2006, Genebuild Sep 2008 [7, 8] for the canine genome; [EMBL: FM946072] for CDKN2B and [EMBL: FM883643] for p14 ARF /CDKN2A. Polymorphisms and mutations in these sequences are described following the recommended nomenclature [57, 58]. To determine the CDKN2B exon 1 alleles present in a collection of dog DNAs of different breeds, the exon was amplified, along with the flanking intronic sequences, using a D4 (Sigma) labelled forward primer 1729 and an unlabelled reverse primer 1730. The length of the product, according to the reference sequence in CanFam2.0 is 388 bp . PCRs were performed using the KAPA2G Robust PCR Kit (Kapabiosystems, Cape Town, South Africa), with buffer B and Kapa Enhancer 1, in a volume of 10 μl, with a minimum of 8 ng of template and a touchdown-PCR starting with an annealing temperature of 72°C, and decreasing by 1°C per cycle to 59°C, followed by 25 cycles with an annealing temperature of 58°C. Annealing, extension (at 72°C) and denaturation (at 95°C) were 20 sec long each. The products were diluted 1:8 with sterile water and loaded on a CEQ8000 sequencer (Beckman Coulter) to determine the size of the PCR products with the Fragment Analysis module of the instrument; 18.25% of the samples were retested to confirm the results. 22.63% of the samples, representing the different allele sizes observed, were amplified again from genomic DNA and sequenced directly with the GenomeLab DTCS kit following the procedure recommended by the manufacturer for GC-rich sequences. Cleaned products were separated on the CEQ8000 at 60°C and results analysed as in the sequences described in the previous section. Multiple alignments of nucleotide and predicted amino acid sequences were done with ClustalW2  at the EMBL-EBI website  or using JalView 2.3  and then manually edited. GenBank accession numbers for p15INK4B amino acid sequences used for the alignments were [Xenopus tropicalis GenBank: AAH75575.1, Rattus norvegicus GenBank: EDL97746.1, Mus musculus GenBank: AAH02010.1, Bos taurus GenBank: NP_001069362, Macaca mulatta GenBank: XP_001107263.1, Pan troglodytes GenBank: ENSPTRP00000035618, Homo sapiens GenBank: P42772]. The sequences for p16INK4A were [Takifugu rubripes GenBank: CAC12808.1, Monodelphis domestica GenBank: AAC23669.1, Bos taurus GenBank: XP_612365.1, Equus caballus GenBank: AAC97110.1, Sus scrofa GenBank: CAB65454.1, Mus spretus GenBank: AAD00236.1, Rattus norvegicus GenBank: AAL76339.1, Mus musculus UniProt: P51480-1, Felis catus GenBank: BAA33540.1, Pan troglodytes GenBank: XP_520513.1, Homo sapiens GenBank: NP_478104.1, CMT28 GenBank: FJ542308.1, NCF GenBank: FJ542309.1] and for p14ARF [Mesocricetus auratus GenBank: AAN75824.1, Rattus norvegicus GenBank: AAL76336.1, Mus sp. GenBank: AAB35770.1, Homo sapiens GenBank: NP_478102.1]. In the flat-coated retrievers allele distribution between cases and controls was compared using a Monte Carlo simulation of the chi-square test and grouping together columns with expected values lower than 5, as implemented in the T2 test of the program Clump ; the level of significance was determined by performing 10000 simulations. These studies were supported by the Pet Plan ChariTable Trust and Cancer Research UK grant reference C8876/A4012. BM received a Domestic Research Studentship from Cambridge University. Some of the DNA samples used in this study were kindly provided by Keiko Miyadera, Veterinary Medicine, University of Cambridge. This project benefited from the use of the University of Cambridge's federated computational grid (CamGrid). JAH performed the LOH study, the sequencing of tumour samples, the DNA extraction and sequencing of blood samples, the alignments and bioinformatics analyses and wrote the manuscript. BM established the primary cell cultures, carried out the cytogenetic studies and made the chromosome paints. CQ performed the BAC mapping. PCMO flow-sorted the chromosomes. TH collected the biological samples and maintained the information database associated with it. SH performed the pathological diagnosis of the tumours and other biopsy samples. MAFS participated in the design of the study and in the interpretation of the results. JMD participated in the design of the project and in the collection of samples. DRS conceived and directed the project, interpreted the cytogenetic and BAC mapping results, analysed the sequencing data and participated in writing the manuscript. All authors read and approved the final manuscript.